Incoherent Thoughts: Time to Slam, Y'all!! Poetry Slam is back in Malaysia! 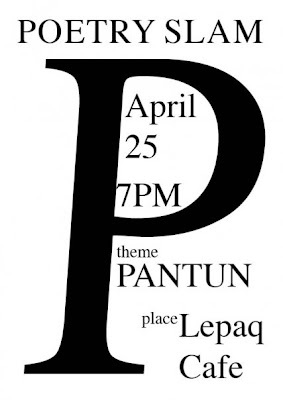 Hosted by George Wielgus and Elaine Foster (previous Slam champs in Singapore and KL),the fourth installment of the Slam in KL this time takes the theme 'Pantun'. And for any of you who have forgotten their schooldays, I suggest Wiki it. Totally open to your own interpretation, all Slammers must perform an original Pantun in the first round only. Slammers can perform in either BM or English or both. Anyone interested to Slam on that night should register before 7:00pm on the 25th. Early Birds can register via FaceBook. The Slam is free to both watch and participate in but a small donation to go back into the prize fund will be much appreciated! • The poems are judged immediately afterward by five people picked randomly from the audience who award numerical values (from zero to ten) to each poem. Individual or group that scores the highest points, wins the competition. • Each poem must be of the poet’s own construction. • Each poet gets three minutes (plus a ten second grace period) to read one poem, if the poet goes over, points will be deducted from the total score. • The poet may or may not use props, costumes, or musical instruments (this depends on the slam master). • Of the scores the poet received from the five judges, the highest and lowest scores are dropped, and the middle three are added together, giving the poet a total score of 0-30. • There are many other kinds of specialised slams – following themes e.g. Dead Poet Slams (classic poets, presented by performers); poetical form slams like sonnet, haiku or pantoum slams; or thematic slams e.g. romantic, environmental slams etc. • Solo or team competition (up to 4 members). • Group competition has become one of the hallmarks of international slam culture and it helps to develop a sense of community and team spirit, adding a great deal of artistic excitement to any slam event. How does Poetry Slam™ differ from an open Mike reading? are engineered as a support network for poets. What kind of poetry is read at Poetry Slams™? commentary, uproarious comic routines, and bittersweet personal confessional pieces. How do I win a Poetry Slam™? • Winning a poetry slam requires some measure of skill and a huge dose of luck. The judges’ tastes, the audience’s reactions, and the poets’ performances all shape a slam event. • There’s no formula for winning a slam, although you become a stronger poet and performer the same way you get to Carnegie Hall — practice, practice, practice. So to sum it all up... You have to check this out. Probably one of the coolest event to ever hit the Malaysia shores. p.s. I just found out that Fynn Jamal and Hazlan are in the Slam! More reasons to go check out the Poetry Slam eh. this entry should be post out before poetry paper... then only i can answer my last question. ish ish ish! sweat a bit? we sweat like a pig kot. susah! so miss, are u going to join the poetry slam? alolo... sian korang. Hehehe. Well, wat to do wats done is done. But be prepared I might make you sweat some more in the semesters to come. Muahahaha!! Unfortunately I wont be able to make it to the Poetry slam. But you guys go ahead la. Check out the pros battle it out. I, on the other hand, will be at SoHo KL promoting my blogshop at the A:Fair Weekend Bazaar. Eh, if you're in the area datang la tgk2 ye. It'll be from 12pm - Midnight. Okay cun! i'll see what i can do. have fun making money there!